For many people the celebration of the 4th of July is not totally complete without a good aerial fireworks show. A good firework show needs to have two essential components to deliver that thrilling experience most of us love to see—sound and color effects. Nanotechnology could make it possible for these fireworks effects to be more spectacular than ever. A firework is a mixture of flammable ingredients contained in a sophisticated device called the shell. The shell is composed of small compartments known as stars where the precise mixture of fuels, oxidizers, and metal salts fly to the sky. The fuel/oxidizer combination is the key to all explosives, like black powder (also known as gunpowder). It provides the energy to put the shell into the air and to carefully control the ignition of the stars. Finally, different metal salts give each twinkling speck its distinctive color—strontium for red, copper for blue, barium for green. 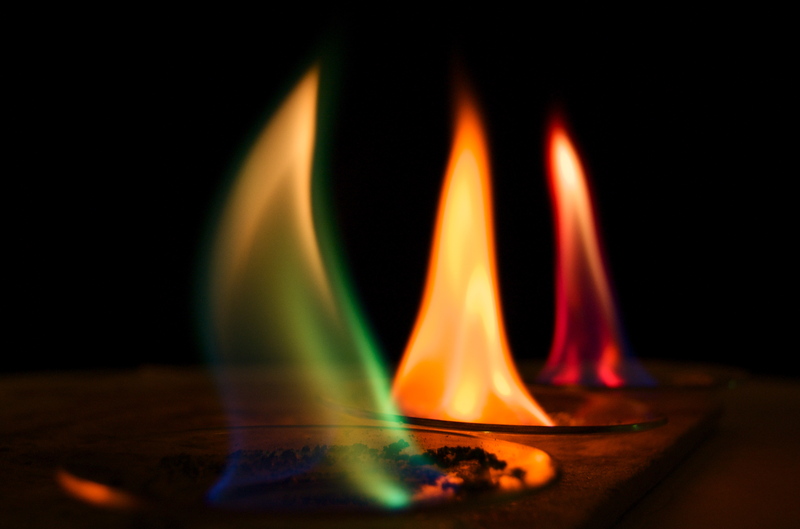 Three different metal salts giving off their colors when in a flame. This is known as a flame test. Image source. Every year fireworks technology brings new improvements—recently, shapes and forms along with new color effects. Although it may seem pyrotechnicians have already mastered most of the firework magic, nanotechnology may contribute new features and add more tricks to the pyrotechnicians’ tool box. 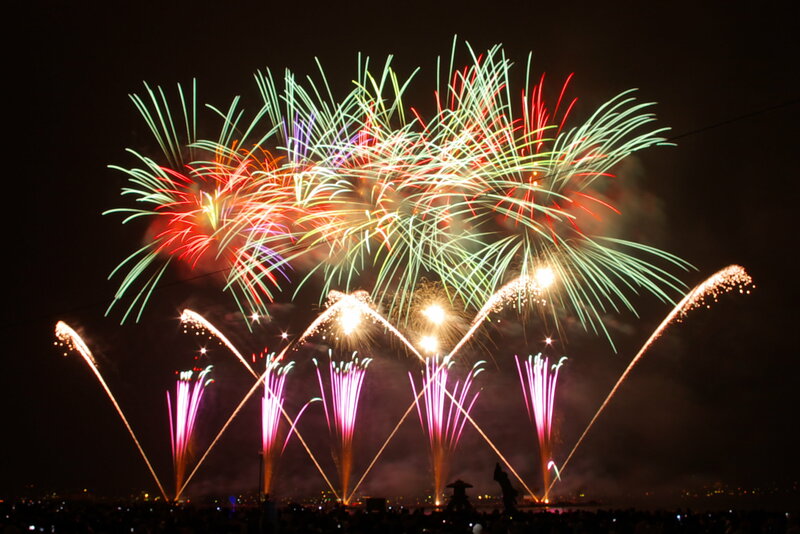 Traditionally, the components in fireworks come in the form of tiny particles in the ~100 micrometer size range (about the width of a human hair). This small size allows the fuel and oxidizer to combine nearly instantaneously—quickly releasing the energy that allows the tiny particles of metal salts to release their beautiful color. But what if these traditional components are downsized by 1000-times, down to the nano scale? A research group in India has done just this working with firecrackers, and their early results are promising. They have found that the smaller size of the components increases the contact between particles, which allows the chemical reactions between them to occur even faster. This new nano combination increases the noise and sensitivity of the firecrackers. The comparison in the sound production in a series of tests determined that it takes 4 grams of micro-sized flash powder to equal the noise level (also known as the “boom”) of just 1 gram of nano-sized flash powder. According to the authors this feature makes firecrackers made of nano powder to potentially be considered environmental friendly because using less material means nano-enabled fireworks would emit less polluting gas and other byproducts. In contrast, the increase in sensitivity will create a safety problem if the nano-enabled firecrackers are not handled properly. A simple blow might be enough to ignite the firecracker. The use of nano powders in fireworks is still taking baby steps. Undoubtedly, the commercial use of nano-sized powders could set a new course for making more powerful and colorful fireworks and bring more enjoyment to people of all ages who eagerly wait for them every 4th of July.